眼睛周圍可用精油按摩嗎? Can essential oil be used around the eye area? Yes it can, eye massage can reduce wrinkles around the eyes. As the eye area is a very tender region, the base oil used better be thin in texture and dilute the essential oil very well. (Around 0.5% dilution rate). That is 3 drops of essential oil in 15ml of base oil. For base oil choices, apricot oil, peach kernel oil, grapeseed oil, hazelnut oil can be used. 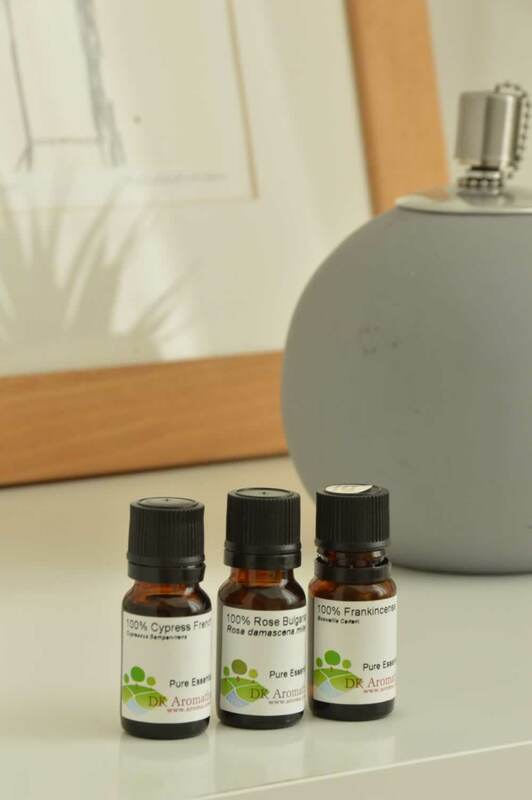 And we can also sue essential oil use as Roman Chamomile, Rose Otto, Frankincense, Sandalwood. These oils not only can reduce wrinkles and dark circles, they also hydrates and firms the skin. 有嚴重黑眼圈.可用什麼配方護理呢? How to relieve dark eye circles? Apply Roman Chamomile as eye mask, then mix 1 drop of Rose Otto essential oil with 15ml of cucumber eye gel, massage the eye area in circular motion until fully absorbed. How to relieve tired and puffy eyes if I use a lot of computer? Put 1 drop of frankincense into a pot of hot water around 500ml, soak and drain the towel. Apply this towel at the eye area for 10minute, remember to close your eyes during the application. 眼睛使用不當，引起眼睛疲勞，可用那種精油舒緩眼部不適？方法如何？ My eyes always feel tired, what should I do? Mix well, and apply it around the eye area, it speeds up blood circulation and ease the puffiness. 因長時間坐在電腦前, 對著螢光幕, 有什麼方法可改善眼部疲勞? I spend a lot of time in front of the computer, how to sooth my eyes tiredness? You can try to use roman chamomile floral water as eye mask to improve problems around the eye area such as tiredness, dark circle and puffiness. 哪些精油合適使用於眼部護理呢? Which essential oil is suitable for eye care? Rose and chamomile roman are good for eye care. Add one drop of the above essential oil into 10ml of eye base and mix well, then it is ready for day and night use. Rose has whitening and anti-wrinkle effect, while chamomile roman is famous for its anti-allergy power. 想自製一瓶眼霜,來舒緩黑眼圈及減退乾紋,有什麼配方?How to DIY an eye cream for relief dark circles and diminishes fine lines? How to DIY an eye cream for relief dark circles and diminishes fine lines?